While the oceans were teeming with life in the Lower Devonian, including giant arthropods and big fish, one would have to look hard to find creatures among the sparse vegetation of terrestrial habitats. This picture may visualize the situation in a funny way. 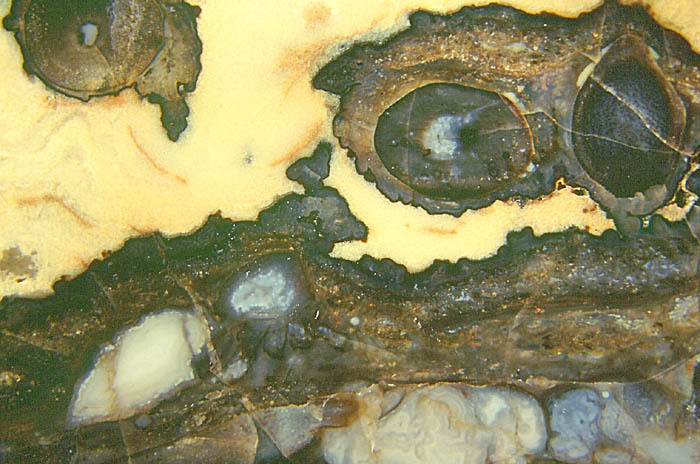 It shows sections of a land plant, including a capsule with spores, and a creature apparently drowned in flooding, all overgrown with microbial slime with confusing contours. Width of the picture 22mm. For details see Rhynie Chert News 9. An overview of the small animals found in the Rhynie chert is given at www.abdn.ac.uk/rhynie/ . There it is stated that "the Rhynie fauna is now the most diverse associated freshwater and terrestrial fauna known from the Devonian and earlier periods of geological time". That overview, however, is not up-to-date. A tiny nematode inhabiting the stomatal chambers of Aglaophyton has been added to the zoo in 2008 . As the latest addition and big surprise, the oldest rotifer ever seen has been found engaged in a dramatic scene involving a hitherto undescribed spherical alga colony: See Rhynie Chert News 23. Soon after publication of the hitherto one and only paper on the crustacean Ebullitiocaris in 2004 , some uncertainty of affiliation has been removed by means of details seen on own finds: Rhynie Chert News 12. Creatures feeding on tissue of live plants and on spores have left their traces but have remained elusive . For more information derived from own finds see Crawling creatures in the list of issues. G. Poinar Jr., H. Kerp, H. Hass: Palaeonema phyticum ... a Devonian nematode associated with early land plants.